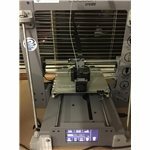 Build, learn and share robotics. New to this site? 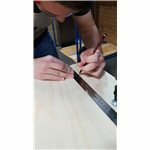 Get started here to share your creation and 20% off your next order! As a first year mechanical engineering project we built a drag based vertical axis wind turbine. The turbine was tested at the University of Newcastle wind tunnel and generated 6W of power at a wind speed of 20 m/s. The turbine was made completely using hand tools, and within a budget of $100, plywood was used as the main structure. The turbine blades were made from large PVC pipe. This is a project to build a 3D-printed replica, life-sized BB8 model from Star Wars. A Long Time Ago, in a Galaxy Far, Far Away... Star Wars Celebration 2015 With the exciting new Star Wars movie coming out Disney & LucasFilm showed off a droid unlike any we had seen before. The a number of R2D2 builders and a dedicated group of fans formed the BB-8 Builders Club, with the intention of constructing their very own BB-8. First prototype of a desk fan that can be controlled by hand gestures instead of a switch around the back. With many fans you have to reach around the back to turn them on and off. 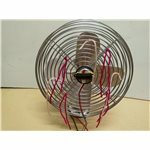 Using a simple infrared sensor this fan can be turned on and the airflow adjusted by pushing or pulling at the air. In the middle of the fan is a sharp infrared sensor. Some string is tied to the grill so air movement can be seen in a video. Warning - This sounds super annoying . Made with bits borrowed from other projects, Mr Hairy attempts to navigate around things. 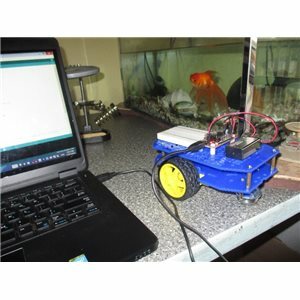 He has a single infrared sensor mounted on a servo to scan for obstacles. Main components are an old Arduino Duemilanove, a Pololu Qik 2s9v1 serial motor driver and two 30:1 low power micro motors. 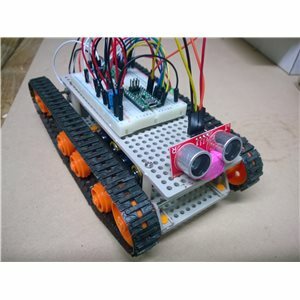 "Tank Bot" is a simple autonomous tracked robot. He navigates over slightly rough terrain avoiding dangers like plants and fences. He is made from Tamiya tracks, twin motor gearbox and uses a Pololu A-Star micro as the brains. 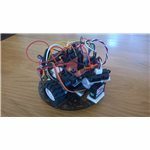 We used this as a starting point for year 9/10 students who had no experience in robotics or coding. 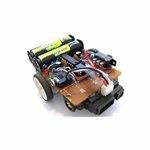 I liked the idea of the bristle bot as it is a very simple entry to making a robot for small children (although beware the button battery). It introduces a child to ideas of movement and balance. You can play around with different toothbrushes to see how the bristles affect direction, and change the placement of the battery and motor to affect how straight the robot travels. This little palm sized robot drives around and tries to avoid things. I made this to see what can be done with little Solarbotics motors and the limited pins on the PICAXE 08M chip but didn't plan ahead so ended up with a lot of crazy soldering. It's not fancy! 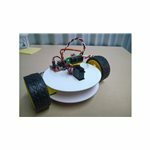 This is a simple robot made using blank DVD's for the chassis and double sided foam tape. It's purpose is to drive around and not run into things. It uses a Dagu S4A mini driver for the brains and a couple of plastic gear motors to drive along. A sharp distance sensor is used to look ahead for objects.